Happy Wednesday! We're back for our final challenge of the month, our traditional Anything Goes challenge at the Simon Says Stamp Wednesday Challenge. The design team are using Lawn Fawn products this week. I've been patiently waiting for this Our Friendship Grows set to come back into stock - it's very popular, and I'm not at all surprised......there are some adorable images in it: 2 sizes of sunflowers, with matching leaves and stems, a pot, a vase, 4 sentiments, and 2 hearts! For my first card I used these big sunflowers. I paper-pieced them, using various Lawn Fawn papers, (Into the Woods and Bright Side), then cut them out and placed them on a kraft card base, adding one of the sentiments from the set and sequins from their Hello Sunshine and Let's Polka sets. I used Lawn Fawn's Let's Polka paper pad to stamp the smaller flowers and leaves and stems. When I stamped the stems and leaves, I cut them all out in one piece, and then left the leaves unglued when I attached everything else down to my card base.......makes for a fun dimension! I used an old zig-zig stamp to ground my pots and the sentiment is from the Our Friendship Grows set, too. Okay, now it's your turn! As always, Heidi has provided another $50.00 gift voucher to the Simon Says Stamp store for one lucky winner - will it be you? Melissa Phillips had the MOST adorable card at Make It Monday, and I couldn't wait to give her technique, which she calls "paper scrap pie charts", a try! I pulled out my big bag of scraps and started sorting out some pinks and greens until I had enough to make up a pie-chart. I don't have any triangle dies, but I do have a Hero Arts Christmas tree stamp that fit the bill, so I stamped it on the reverse of each of my scraps and cut them out. I used my Nesties scalloped rectangles and scalloped hearts dies and a Doodlebug dp for my background, along with this pink button, and another of Winnie & Walter's big bold words from their The Big, the Bold & the Happy (can you tell I REALLY love these stamps?) and stamped it in Simon's Doll Pink ink. Put everything together, and THEN I remembered that we are supposed to include something from PTI - NUTS! So once I had the technique under my belt, I went back again, and used PTI aqua mist design papers and their Beautiful Blooms II #1 die to make this monochromatic version. The sentiment this time is from a Lil Inker designs set called Darling Diamonds, inked in Hero Arts Mint Julep. Again, I used a button (thanks, Clare!) to cover the center seams - to me it goes along with the quilted look that this technique gives. This is lots of fun to do; give it a try yourself! Having just got some new Winnie and Walter stamps, the challenge at Moxie Fab World: Hip on Handwriting couldn't have come at a better time! My own handwriting is atrocious and getting worse, so I was happy to be able to play with them. I made 2 cards today. What's really nice about these stamps that I didn't realize when I bought them is that the small words included along with the big handwritten ones allow you to make almost any sentiment that you can think of. Thanks so much to Karen for pointing me in the direction of Audrie's tutorial, where she explains how to use an embossing folder as a kind of stencil to make your own backgrounds. I had a fun time playing with some of my folders. This result was my favorite. Try it, it's really fun, and it's another use for all those embossing folders that you may not be using so much anymore! 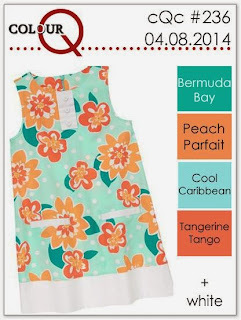 Happy Weekend, and welcome to my little stop on the Pretty Pink Posh Sequin Shaker Blog Hop! Shaker cards have long intrigued me, and I'm so glad that Paulina has thought of having a hop devoted to nothing but shaker cards! These are the first I've ever made, and they were really lots of fun! And I learned a thing or 2 along the way. On my second card, the whole front is built up with mounting tape above the stamped card front. It was just a matter of die-cutting the scalloped rectangle, then cutting out a square from the top of it and the patterned paper front, then enclosing that "hole" with mounting tape and affixing the panel to the stamped card base. And 1 more, redoing a card I made earlier this year for our little granddaughter. Wish I'd have known how to make these back then! Thanks for visiting me today. I encourage you to give this a try - these are really so much fun to make and the sky's the limit! And if you didn't come from Paulina's blog, please visit the Pretty Pink Posh blog for some wonderful examples of shaker sequin cards! I used the flowers and leaves from their Thanks a Bunch set, stamped in Mint Julep, Audrey Blue and Green Apple inks, and the sentiment is from their Oh Happy Day set, in Audrey Blue - love that font! I stamped the flower buds a few extra times in the white spaces to get more of that color into my panel, and I found some enamel dots by MME that came pretty close to the colors. Thanks for stopping by today - almost weekend! It's Wednesday and time for a new challenge at the Simon Says Stamp Wednesday Challenge! This week our theme is to keep it Clean and Simple, and you have an option to make a 1-layer card, too, if you wish. The DT are all using Hero Arts products this week. You don't have to use them for your creation, but we'd love to see them if you do! Hero Arts has been dear to my heart ever since I started stamping, so this is a special week for me. I've made 2 cards, one using new stamps and the other some older ones. My first card uses a new set from the Stamp Your Story series, Cherish Yesterday. It contains some beautiful florals, one of which is this lilac sprig, which is a flower that holds much meaning for me. I stamped it in 3 inks: seedless preserves and dusty concord distress inks, and Hero Arts Passion Flower. The butterfly is from a sister set called Forever. It was stamped in Hero Arts Iris ink, fussy cut, and popped up above the card. In order to get 3 stampings across, my card is 6 1/4" long, as opposed to the usual A2 size of 5 1/2". My second card features the beautiful cling spray of flowers from the set Floral Blossoms. It is the perfect stamp for a CAS card, as it will fill up most of the card, leaving just enough room for a sentiment. I used Distress markers to color the stamp itself, and then simply stamped it onto my white card base. My sentiment is from HA's Dauber Bunch, and I added pink and green sequins from Pretty Pink Posh's Springtime Mix and some clear sequins from a former Simon card kit. Now it's your turn - what will you make that's CAS? Heidi has provided another $50.00 gift voucher to the brand NEW Simon Says Stamp Store to the random winner of the challenge. Just playing today, inspired by Pinterest and some new stamps! I found a pin that led me to this Lift Challenge and I loved the paper-pieced chevron-like design that the ladies were presenting, so I pulled out my new Bazzill Vintage Lace paper pad and made up my little panel with these pretty papers. Then this morning my order from Winnie & Walter arrived, including the popular The Big, the Bold, and the Happy set, so this is its inaugural stamping. I decided to stamp it on vellum and attach it to my pieced strip, and then I added this Hero Arts Jeweled Flower. As always, thanks so much for stopping by - enjoy your weekend! ETA: I'd like to add this card to the Hip on Handwriting challenge at Moxie Fab World. I loved it so much that I thought I'd use the same elements that Shari did, but instead of distress inks, use design papers and see what happened. The big background paper is from Pebbles Garden Party pad. I stamped the background from Tim Holtz Papillon and white embossed it on that paper. That was attached to a card base of Simon's Sea Glass cardstock. The heart die is also Simon's, Large Doily Heart, cut from a piece of tone-on-tone check paper. After cutting, I stamped and white embossed the butterflies from the same Papillon stamp set. My die-cut Mom uses Hero Arts Alphabet Uppercase dies, and BoBunny double dot paper. And to finish I added some craft store paper roses and several groupings of irridescent sequins. So, what do you think? This is definitely a brighter, busier version, but I hope that I achieved the feel that Shari evoked. Thanks for stopping by today! Have a wonderful Easter celebration! 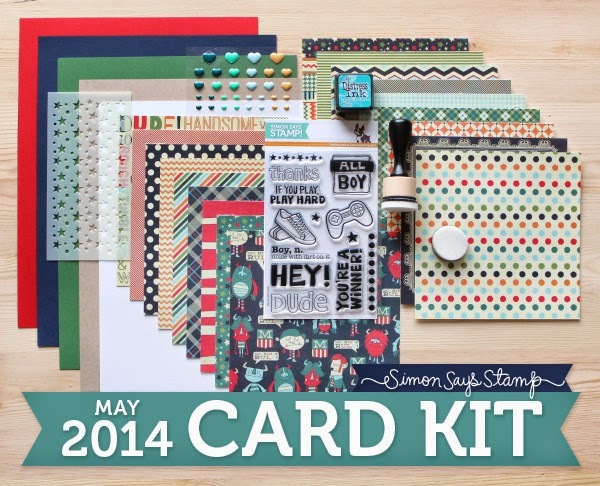 The Simon Says Stamp May Card Kit is available, and it's chock-full of items involving boys! One of the papers in the kit is a wonky red and cream stripe, and for some reason I decided to make it even wonkier and cut it up into angled pieces. I attached them to the Neenah Desert Storm card base, and then stamped a sentiment and an image from the stamp set, colored them in, and framed them up, and attached that also. Love that sentiment - isn't it the truth? And for this one I used a few of the papers again, cutting them into strips and lining them back up on an angle, then stamping another of the sentiments and a strip of stars. If you have boys in your life, you may want to consider getting this card kit - it really is one of a kind! A real little plus for this one is that it includes one of the new mini Distress ink pads in Peacock Feathers, and a new applicator and a few sponges to fit it - here's a great way to find out if these are something you can't live without! It's Wednesday and that means another challenge at the Simon Says Stamp Wednesday Challenge! Stampendous makes about 3 of these little chicks wearing hats - this one is called Floral Bonnet Baby, and I'm sorry to say that all of them went out of stock at the Simon store since I got her. I colored her with some Spectrum Noir markers and paired her up with some Doodlebug Designs Hello Spring design papers. My sentiment is computer generated around my stamped "Easter" (from a discontinued The Craft's Meow Easter set). And I've been humming this song ever since this card was conceived! This image just makes me smile, and brought to mind the term "bluebird of happiness", so my sentiment seemed right with it. I colored these sweeties again with my Spectrum Noir markers, then cut them out into a Nestabilities Labels Twenty die, and sponged on some tumbled glass distress ink while it was still in the die. I thought the blossoms from Simon's Thinking of You set were a good match to the ones in the main image, and I added leaves from Lawn Fawn's Stitched Leaves die set. Now it's your turn! What will you make this week? As always, there's a $50.00 gift voucher to the amazing Simon Says Stamp Superstore up for grabs to a random player! The smallest are scilla; I have patches of the blues growing with the little daffodils and a small clump of the white ones out back. The other 2 flowers are Lenten Roses. The daffodil is tete-a-tete, about 2 1/2" across at its widest point, to give you a reference here; much smaller than a "normal" daffodil. What do you have popping up? I'd love to see! I wanted to play with the Muse Challenge this week, and almost left it too long, but am slinking in at the 11th hour. Vicki Dutcher is our muse this week, and I think it's pretty obvious that I was inspired by the solid flower, the mixed colors in the sentiment, and the red ribbon. I immediately fell in love with the inspiration photo at the ColourQ challenge this week - don't know why it took me so long to make a card with these scrumptious colors! They make me think of Florida! supplies: Technique Tuesday's Two Steppin, sentiment from Lil' Inker's Darling Diamonds, Adirondack Sunset Orange, Hero Arts Orange Soda, Simon Says Stamp Audrey Blue inks, lots of masking, and sequins from Lawn Fawn to bring in that paler aqua color. Still playing with distress inks and solid stamps. This one is for the new Hero Arts Spring Sketch challenge, using their sketch #2. I used a solid butterfly from their Forever cling set and picked raspberry, orange marmalade, worn lipstick, and squeezed lemonade distress inks on watercolor paper, covering as much of the surface as possible. Then I spritzed with water VERY liberally, until the colors were running and blending. Next I blotted the whole panel with a paper towel, and dried it with my heat gun. I made my own tag and chose this old Watercolor Coneflower wood stamp. I smooshed picked raspberry, orange marmalade and mowed lawn on an acrylic block, spritzed them with water, then picked up the colors individually with a brush and painted right onto my stamp. I tried making a banner as the sketch shows, but it covered up too much, so I decided to stamp it right over everything instead. It's from their Find Joy clear set. To finish, I added a coral ribbon and some sequins for sparkle. And here's another, following sketch #3, and using a similar watercolor panel using the same Forever butterfly and distress inks as above. For this card I took that big circle as a theme and used dotted washi tape, a border of dots, and some circular sequins. Other HA stamps used: Traditional Butterfly, and My Happy. I stamped and clear embossed the butterfly, then used orange marmalade and picked raspberry mixed with water to paint in the colors. The challenge runs through May 25, so there's lots of time for you to enter, too! There are FIVE $30.00 gift certificate prizes up for grabs!